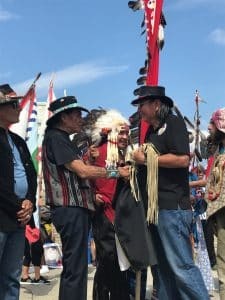 On October 29, 2017, American Indian Movement co-founding leader Dennis Banks went to the spirit world, as his family recounts, after heart bypass surgery. My blog only occasionally posts about people who have died, lest this site become an obituary page. Dennis merits this posting, in which I also further discuss Jun Yasuda, a mutual close friend of Dennis and me. Jun Yasuda is a key component of my discussion of Dennis Banks’s relevance to me. January 1991 was a major defining moment in my life, when I met my friend and major spiritual teacher Jun Yasuda, praying for peace during Gulf War I across the White House, fasting for weeks on water. My fateful 1991 meeting with her as she fasted across from the White House, for peace during Persian Gulf War I, was a critical turning point. It came near the time that Ram Dass came more fully to my attention, a few months before t’ai chi came more fully to my attention, a few years before I started getting more of a sense of the meaning of Tao, and just months before I left a corporate law firm job to become a public defender lawyer. Jun-san was the main catalyst for me to move in the direction of powerful, peaceful, and effective harmony. Before meeting Jun-san, I was obsessed and angry over all the rampant human rights violations throughout human history. Jun-san — and, later, t’ai chi, the Dalai Lama and Gandhi — showed me not to be any more angry at injustice than I would get angry at a devastating hurricane, tornado, or earthquake. Born in 1948 in Japan, Jun Yasuda — a Nipponzan Myohoji Nichiren Buddhist Nun since the 1970’s — sought her path, as I was seeking my path when I met her, which resonated all the more with me in connecting with Jun-san. As Mark Rondeau relates, Jun-san “describes herself in her youth as a city girl who used a motorbike and ran with wild kids, confused and angry at society. She went to college and held many jobs, including as a saleswoman and a teacher. That didn’t make her happy so she didn’t know what to do with her life. She married, but although she and her husband didn’t fight and have since remained friends, she got divorced. Eventually she went to India.” Read the rest here. Jun-san came to the United States in 1978 to join the original Longest Walk, from Alcatraz to Washington, D.C., to promote Native American rights. 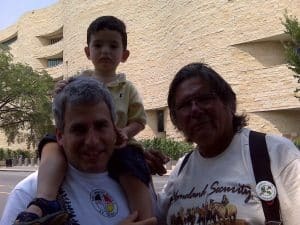 One of the walk’s leaders was Dennis Banks, also known as Nowa Cumig (“at the center of the universe”), whose biography Ojibwa Warrior (2004) is essential reading to understand the self-empowerment and plight of Native Americans right into the twenty-first century. This video documents the original Longest Walk. At minute 3:30, Jun Yasuda beats the handheld drum, chanting the Odaimoku peace prayer/essence of the Lotus Sutra: Na Mu Myo Ho Ren Ge Kyo (the acronym of which is on my license plates). Around the time of the Longest Walk until his departure in 1983 as California governor, Jerry Brown refused to extradite Dennis (here in A Good Day to Die) to South Dakota, where he was wanted after being convicted in a rioting prosecution. With George Deukmejian as the next governor, Dennis departed to the Onandoga Nation in New York state, and turned himself in not long after that. Jun-san joined Dennis to the Onandoga Nation, and frequently fasted and prayed for Dennis on the steps of the Albany statehouse. In 1983, during one of her fasts, an activist for Native Americans, Hank Hazelton, met Jun-san, and offered her a beautiful piece of land in nearby Grafton for her to build a peace pagoda. That peace pagoda became a completed reality several years later, and is among my favorite places on this earth. “The Buddhist monks and nuns sitting still on the ground in front of us were chanting when the police rushed them and started cracking skulls with a terrible sound as if they were striking coconuts. The monks and nuns did not fight back. It was a terrible thing to witness. I saw elderly nuns with blood streaming down their faces… Sergeant Johnson suddenly grabbed his BAR and fired a round into the air. Then he hollered [in Japanese] ‘Stop it! Stop it! Halt!’… Then all was quiet.” Ojibwa Warrior. Many people in life have had plenty of reason to be angry, but have found a more powerfully peaceful approach to their activism, including Ghandi, the Dalai Lama, and Dennis Banks (here addressing from violence to non-violence). I witnessed Dennis’s powerful gentleness each of the four times that I was in his presence, personally speaking with him in 2006, 2008, and 2016. As a previously angry human rights activist and originally angry criminal defense lawyer (when I started in 1991), such people inspire me to remain on the powerfully peaceful path. Much is left to be accomplished for the Native American cause. Dennis Banks was a major actor in that movement. Dennis passed away around 10:10 p.m. Central Time, October 29, 2017. As recounted by his family on Facebook, his family sang him the American Indian Movement song as his final send off to the spirit world. Deeply thanking and bowing to Dennis Banks, 1937-2017. Sending him and his family prayers.